Steve, Sara and Kevin are pleased as punch at another BCBS donation! 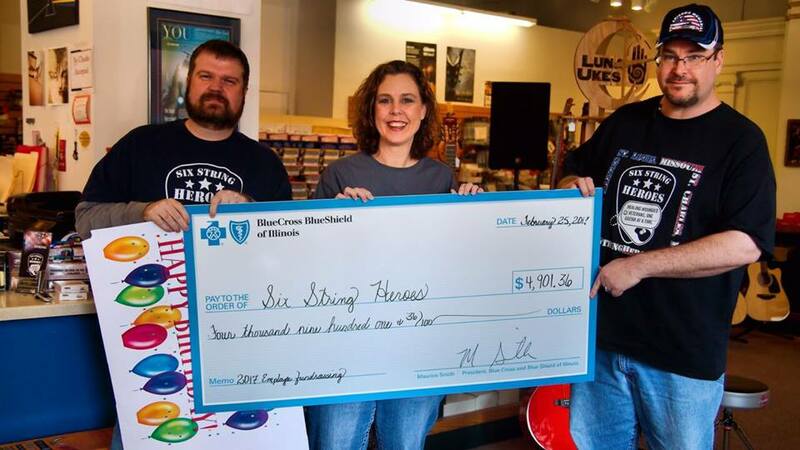 EVERY FEBRUARY, THE employees at Blue Cross/Blue Shield have a fundraiser for Six String Heroes. Every year they vow to raise a little more than the last. And every year, they deliver. 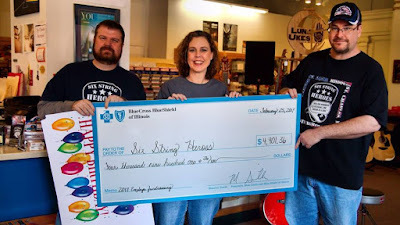 Saturday at Second String Music, Sara Heiden and her crew presented Six String Heroes founders Steve Stoner and Kevin Sullivan with a check for almost $5,000. In the six years they've been doing this, Blue Cross/Blue Shield has donated $30,000. It's mind-blowing and humbling to have such great backing. Steve and Kevin are overwhelmed with gratitude, and we can't thank Sara and her angels for busting their butts every year with T-shirt sales and lunches at BCBS headquarters in Quincy. Sheryl and I join Frank and Cindy at Vancil Performing Arts in expressing our appreciation and gratitude to Sara and crew. And thanks as always to Mike Sorenson of Bad Wolf Media for taking photos. We all have stories about how this program has helped veterans, and I've had several awesome students go through the program in the past couple of months. One of them was a pretty good player already but just needed a little direction and idea why things work. He uses guitar for therapy, precisely the idea behind Six String Heroes. When we were done, I presented him with a beautiful donated Takamine acoustic, and he shed a tear when holding his new guitar.. Truth is, so did I.